This article briefly explains how to configure DSL modem in bridge mode from a computer, so that the computer can access to Internet by using dialer. 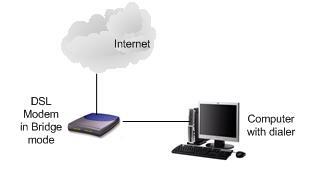 This is very common setup after you have subscribed new DSL broadband service, you just need to configure the modem as a bridge, and after that configure PPPoE dialer in Microsoft Windows by providing username/password or other network information for accessing Internet. If you plan to connect the modem to router and set up a home network, you must set bridge mode on modem too. 1) Connect DSL modem’s LAN port to computer’s network card by using straight through network cable. 2) Read the modem manual, find out the default modem IP address, after that you need to set computer with the IP address in same network with modem, so you can access and configure it. As an example, if the modem IP is 192.168.1.1, I set computer IP as 192.168.1.10 (you can set 192.168.1.X, X= number between 2 and 254), netmask as 255.255.255.0 and gateway as 192.168.1.1. 3) Open a web browser and key in http://DSL-modem-default-IP (example: http://192.168.1.1) into the address bar, after that hit Enter key. 4) The modem logon screen will appear, type in default username and password you found in modem manual. You will then log on to the modem management page. 7) Ok, at this stage you have done the modem configuration, you can then proceed to configure PPPoE dialer on connected computer. If you need help, here is PPPoE dialer setup in Windows 7, Vista and XP. If this modem is connected to router (wireless or wired), you can then proceed to configure that wireless router or Ethernet wired router. 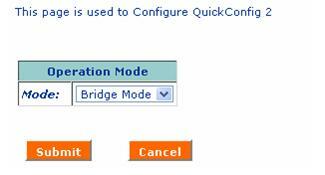 Return to top of "Quick Way to Configure DSL Modem in Bridge Mode"! !